Autumn is the return of warming, oil rich foods to nourish during the season which is known for its cooling and drying qualities. 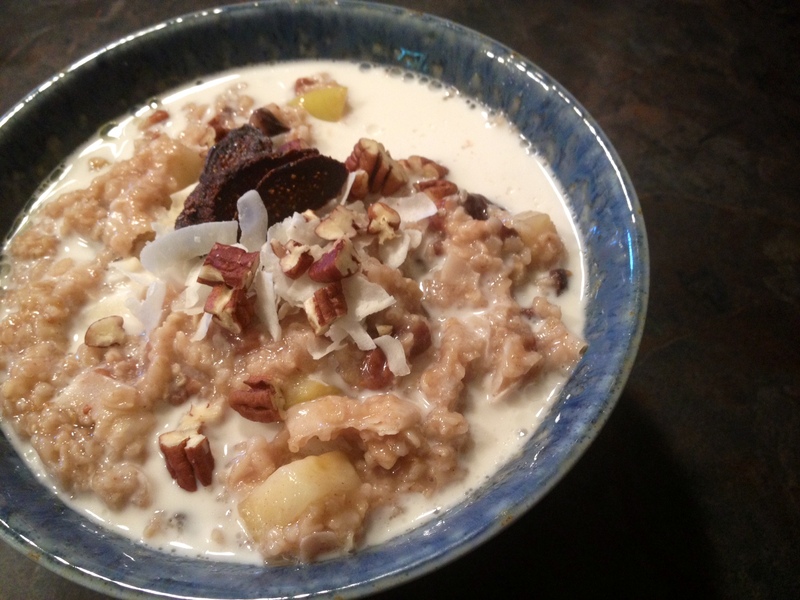 This oatmeal is filled with fall apples, dried fruits, and pecans with rich ghee and coconut. You could swap out the quick oats for steel cut oats or rolled oats, just be sure to add more more water. Bring water to a boil, then add oats, figs, apples and sweet churna. Stir, turn down to a simmer and cook until desired consistency, about 3-5 minutes. Hmmmmm, love my oats – I’ll definitely try this recipe! Willie St Co-op has a coursely rolled variety that cooks faster than steel-cut, but offers more texture than the old-fashioned oats.